The Summit Free Public Library’s mission to inform, enrich, and inspire takes on special meaning during National Library Lover’s Month, with a series of programs, author talks, lectures, and a musical performance that celebrate the rich diversity of our community and our commitment to improving people’s lives through information, education, and enrichment. Visit the library during National Library Lover’s Month and help us celebrate. We hope to see you at one or more of our many programs this month! The month kicks off with a performance on Sunday, February 3 at 2 p.m. by Synergismus Duo, a violin-cello pair who will get everyone in the mood for Valentine’s Day. The concert will cover 400 years of music, featuring Renaissance love songs, classical opera arias, tangos, and Broadway love songs. Funding for this program is made possible in part by the NJ State Council on the Arts, through a grant from the Union County Office of Cultural and Heritage Affairs. Join us for a 4-week course taught by Rutgers University’s Bruce Tucker on America’s Foreign Interventions. Running on consecutive Fridays starting February 8 from 10:30 a.m. – 12:30 p.m., Professor Tucker will cover US foreign policy as it pertains to regime changes since the establishment of the Department of State. This course is made possible through a generous grant from the Summit Area Public Foundation. Would you like to travel the world, or back in time, or perhaps just learn how to improve your own backyard? You can do all that and more at the library this month as we offer an eclectic array of lectures and author talks will suit every family member’s taste. Join author of African American Women Chemists in the Modern Era, Jeannette Brown, on Tuesday, February 5 from 7-8:30 p.m. for an interesting discussion that details the lives of 18 living women chemists who are doing remarkable work in the field of chemistry. On Tuesday, February 12 from 6:30-8 p.m., the Great Swamp Watershed Association and the Rahway River Watershed Association are sponsoring a lecture by Marian Glenn, Summit Environmental Commissioner, on Water Quality and Management in our Area—Green Infrastructure for Managing Storm Water, as part of their One Water series. Attendees will learn about elements of landscape architecture and how they can meet New Jersey’s new rules for storm water management. Glenn will detail how homeowners can utilize aesthetically pleasing options for meeting these new rules. On Tuesday, February 19 from 7-8:30 p.m. the library is thrilled to welcome Amy Knight, author of Orders to Kill: The Putin Regime and Political Murder. Knight, a historian and expert on the Soviet Union and Russia, has been described by The New York Times as “the West’s foremost scholar” on the KGB. Registration for this program is requested, as seating is limited. You can call the library at 908-273-0350, ext. 818 to reserve a spot. Are you curious about George? Washington, that is! On Thursday, February 21 from 7:30-8:30 p.m., Joel Farkas, National Park Service docent at Washington’s Headquarters, will present on George Washington, New Jersey, and the Revolutionary War. Farkas will discuss Washington’s New Jersey battles as well as cover Washington’s time wintering in Morristown. There will be a slide show of Ford’s Mansion, which served as Washington’s headquarters. Chinese New Year—Let’s Celebrate the Year of the Pig! 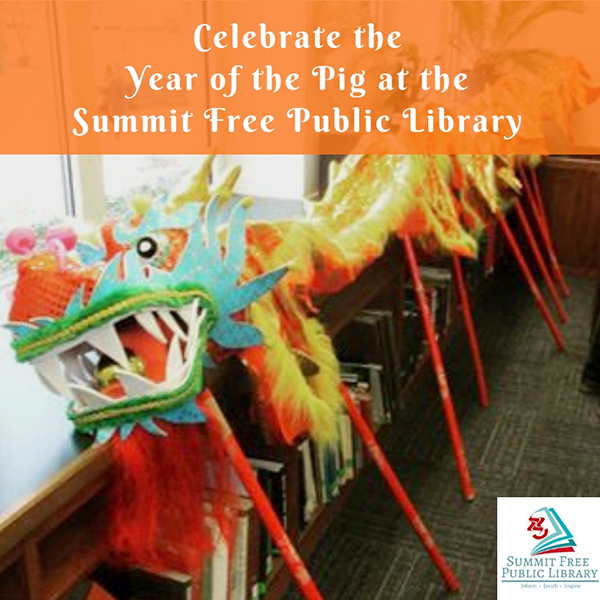 Kids and their families can join in the festivities as the Summit Free Public Library celebrates the Year of the Pig! Visit us this month and marvel at the Chinese art and lantern decorations you’ll find throughout the library! Our Chinese New Year Celebration week starts on Tuesday, February 5 from 7-8:30 p.m. with A Taste of China! We’ll learn how to make traditional food typically eaten on New Year’s Eve and enjoy some delicious food and tea. On Wednesday, February 6 from 7-8:30 p.m.join us for Chinese Calligraphy and Traditional Chinese Painting. We will introduce the origin of some Chinese characters and teach kids how to write their name in Chinese, along with traditional crafts, paper-cutting demo and more. On Thursday, February 7 from 7-8:30 p.m.families are invited to participate in Face Painting and Movie Night. Children will learn about the famous Beijing Opera, get a chance to face paint for the opera performance, and try on the opera costumes, such as the Monkey King, prior to watching the Beijing Opera cartoon movie Havoc in Heaven. We’ll wrap up our week of celebrating with a big Chinese New Year Celebration on Sunday, February 10 from 2-4 p.m. We’ll kick off the festivities with the Lion Dance, do a few Chinese New Year activities, and enjoy some light snacks and tea!